Gehl Studio is an urban design and research consultancy with expertise in the fields of architecture, urban design, landscape architecture and city planning. Gehl addresses global trends with a people-focused approach, utilizing empirical analysis to understand how the built environment can promote well-being. Gehl’s work is based on the human dimension – the built environment’s effect on social interaction between people. We consider lively and widely used public spaces to be vital keys to quality of life in cities and to overall wellbeing. J. Max Bond Center on Design for the Just City at the Bernard and Anne Spitzer School of Architecture at the City College of New York, believes that design can have a positive impact on urban reform in our nation’s cities. Founded in 2011, the Bond Center is dedicated to the advancement of design practice, education, research and advocacy in ways that build and sustain resilient and just communities, cities and regions. This work involved many interviews and conversations with people working directly with NYC’s public plazas. We are grateful to the many people who met with us and shared their insight. Our collaboration and this study starts with a simple question: can the design of public space have a positive impact on public life and urban justice? 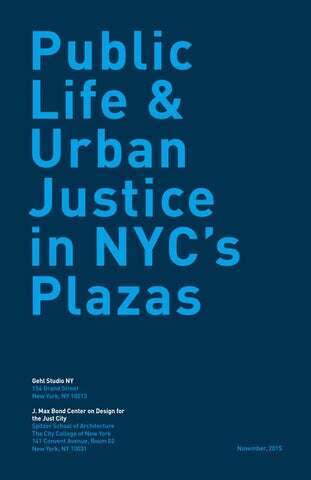 This report, ‘Public Life and Urban Justice in NYC Plazas’, is the culmination of an 18 month collaboration between Gehl Studio, the J. Max Bond Center and Transportation Alternatives to develop, investigate, measure and evaluate how New York City’s Public Plaza Program and seven of its recently implemented plazas contribute to quality public life and greater social justice. The NYC Plaza program is a unique initiative that has leveraged community support to create 61 plazas across the city. The economic benefits of the program are widely documented, but little is known about how these places perform for people in terms of the quality of public space and robustness of public life. We developed a unique valuesbased indicator framework with 74 distinct metrics designed to not only understand traditional economic measures of success, but the ways in which the design, design process and ongoing management of these spaces effects issues of equity, access, connectivity, choice, diversity, ownership, participation, inclusion, beauty, health, creative innovation, and public space and life. While there are 74 unique metrics, there are a few key simple ones, such as who uses the plazas, when they spend time there, and what activities they partake in. This report describes our study motivations, methods of data collection and analysis, key comparative findings, individual plaza findings, and recommendations for plaza improvements and further development and use of the indicator tool. Overall, regarding plaza performance, we found that the plazas uniformly provide choice, access, transit connectivity, participation, creative innovation, and beauty. When plazas are in primarily residential areas, they are mostly visited by the local community living within a two mile radius -, support meeting or recognizing new people, and generate a high rate of a sense of ownership. To a lesser extent, the analysis revealed that not all plazas have more than moderate levels of diversity, inclusion, and social connectivity. These measures in particular revealed varying degrees of positive public life relative to social interaction, activities, and gender, ethnic and generational diversity. With regard to equity, the hardest value to measure design’s impact on, the study showed the addition of plazas improved equitable distribution of initial capital resources, increased neighborhood access to open space, and that users of the plaza seemed to equitably mirror the population of the local neighborhood. However, there was less than equitable funding for ongoing maintenance, management and programming, which was directly related to the overall wealth of the plaza neighborhood. Findings related to the usefulness of the indicator framework tool revealed that in order to assess public life and social and spatial justice, observational surveys and intercept surveys (actually talking to users of the plaza) were essential to collecting an accurate assessment of the plaza’s impact. Collecting this data effectively required manpower and multiple visits to the plazas to assemble a useful sample size from which to draw conclusions. This report concludes by offering recommendations to the Mayor’s Office, the NYCDOT, DCP, HPD, DOHMH, and plaza management organizations about ways plaza implementation, funding, design, and programming might evolve to achieve even greater improvements to public life and urban justice. An assessment of the current indicator framework and ways it could be improved for broader use by cities and communities is also provided. How can we mesh these indicators together to study connections between public life, public space, and urban (social and spatial) justice? The NYC Plaza Program Over the past seven years, the NYC Department of Transportation has partnered with community organizations to create new public plazas in neighborhoods lacking open space across the city. Today, there are 61 plazas in all five boroughs. The plazas range in size from 3,000 square feet to 50,000, and in location, from the wealthiest NYC neighborhoods, such as the Meatpacking district in Manhattan, to some of the poorest, such as New Lots in East New York, Brooklyn. How do we measure the social impact of 55 new public plazas and the reclamation of 400,000 square feet of road space for public use? In 2007, Gehl conducted its first â&#x20AC;&#x2DC;Public Space Public Lifeâ&#x20AC;&#x2122; survey in NYC. The findings were integrated into the NYCDOTâ&#x20AC;&#x2122;s â&#x20AC;&#x2DC;World Class Streetsâ&#x20AC;&#x2122; report and led to a range of public space interventions, from new cycling infrastructure to pedestrian plazas on formerly vehicular streets. In less than a decade, the paradigm for New York Cityâ&#x20AC;&#x2122;s roads transformed in a way that it had not since vehicles were invented over 100 years ago. In 2010, the City began studying the impacts of these spaces, primarily with a focus on economic impact on sites in central business districts. Key metrics included economic vitality (sales tax receipts, commercial vacancies), user satisfaction, and the number of users. While rising property values and retail sales demonstrated the economic success of these reclaimed spaces, there was a lack of information on the social impacts. For example, at Pearl Street Plaza in Lower Manhattan, retail sales increased by 172%, but there was a lack of data collected to demonstrate improvements to residentsâ&#x20AC;&#x2122; or plaza usersâ&#x20AC;&#x2122; quality of life. PlaNYC Sustainability Indicators Sustainability This program was launched in 2007 and establishes a set of 29 sustainability indicators, largely seeking to measure environmental systems, such as air quality, waste supply and waterways, energy, and climate change. Transactions Transformations Translations | Social Movement Launched in 2011 this program establishes a set of 10 participation and social movement building indicators. Each one of those indicators has a â&#x20AC;&#x2DC;transactionâ&#x20AC;&#x2122; (quantitative) and a â&#x20AC;&#x2DC;transformationâ&#x20AC;&#x2122; (qualitative) subcategory. Gross National Happiness Index Human Wellbeing This survey-based program was launched in 2010 and is used by the Bhutan government to assess human wellbeing, quality of life and other non-economic aspects of wellbeing within the country. CEOs for Cities | Vitality Launched in 2006 and revised in 2012. It establishes a set of indicators that seek to measure how urban leaders can focus on making cities more connected, innovative and talented. The goal is to encourage investment in a cityâ&#x20AC;&#x2122;s distinctive assets. Public Space, Public Life Surveys (Gehl) Created 40 years ago, this program is guided by principles of observation and survey work. It aims to collect peopleoriented data regarding public space design and use. Impact studies to date have demonstrated how public space can support economic growth and make streets safer from crashes, but they have not explored how design impacts urban justice and robust public life. Who benefits from these urban changes? Functionality While the impacts of the NYC Plaza Program appear positive, they don’t tell the entire story of how the reclaimed spaces are being used and by whom. They do not help understand how the plazas relate to - if at all - other conditions in the city, such as income disparity and growing inequality. This study builds on the momentum of both Bloomberg’s transportation and public space programs and de Blasio’s goals to develop projects via a more inclusive, equitable process. This study creates an indicator framework tool to better understand connections between design and social and spatial justice. To understand if public space design can promote more equitable access to social, cultural, and economic opportunities, a clear, easy to use method to measure and evaluate who feels invited to new public spaces, or who doesn’t, how the spaces are used, and what types of economic or social opportunities they foster is needed. #onenyc This study builds on the metrics identified in PlaNYC to measure urban change, and on the more recent goals outlined in One New York, which focuses more directly on an equitable NY. This study looked at seven sites: two in Manhattan, two in Queens, and three in Brooklyn. They range in size from 3,800 to 40,000 square feet and in how they began: Corona Plaza was a 5-year community organizing initiative, while Diversity Plaza was led by a few committed residents. In Brooklyn, Zion Plaza is maintained by a dedicated local BID, and New Lots Plaza by a small business owner. Flatiron and Meatpacking - in Manhattanâ&#x20AC;&#x2122;s central business district - are well funded. They all are in neighborhoods that lack open space. Core Research Agenda How does reclaimed street space - in the form of NYC public plazas - impact urban justice? NYCâ&#x20AC;&#x2122;s population is growing. So is the gap between rich and poor. At the same time, public space is being reshaped through a people-first lens. Community groups have protested public space out of fear that it will accelerate neighborhood change and exacerbate disparities. How can we investigate the relationship between public space improvements, neighborhood change, and who benefits? Can the impact of public space on quality of life be measured? Can an improved public realm perform economically and support the social needs of communities? Who benefits from public space improvements? Urban Justice Research Agenda Are reclaimed streets providing more equitable distribution of open space? Do new spaces promote greater diversity of users and choices of outdoor activity? Are public places facilitating greater transit and social connectivity? Can improved access to public space promote greater neighborhood health and wellness? Can these spaces deepen a sense of community participation, belonging and ownership by residents, businesses, and stakeholders? Do the new spaces inspire creativity and improve beauty in the neighborhood? A Combined Research Approach By applying Gehl Studio’s method of design ethnography and the J. Max Bond Center’s ‘Just City’ values, this project seeks to answer whether the impact of design on urban justice can be measured. The JMBC Just City values were used as the overarching indicator framework. Within each value, a combination of public life (how people use space and who they are), public space (quality and design of the space) indicators and urban justice indicators (human health, economic, civic, culture, aesthetic, and environmental wellbeing) were included. The combined approach looks in more detail at not only what’s happening in a space, but at who is there and how access, use, movement, and ownership differs depending on design, geography, and local socio-economic demographics. Four methods were used to observe functionality, conditions, and behavior: intercept surveys, observational surveys, desktop research, and interviews. We engaged directly with users about their experience, researched the local sociodemographic and land use context, and interviewed plaza stakeholders and managers to understand the history and goals of each plaza. JMBC has assembled a collection of metrics, both social and spatial, designed to evaluate the ways the design of the built environment affects six wellbeing indicators – health, economy, civics, culture, ecology and environmental design. For the purpose of evaluating urban justice and the public realm, JMBC has selected the following values for this indicator framework tool: 1. Equity. Designing for equity in the public realm examines how the plaza increases the overall amount of accessible open space for the neighborhood and if its costs and operating budgets are structured on par with other plazas in the city. 2. Ownership. Designing for ownership measures how the plaza promotes one’s belief that the space belongs to their neighborhood and an individual sense of stewardship for the plaza’s activities and upkeep. 3. Choice. Designing for choice examines whether users and the community have multiple options and flexibility for what they do in the plaza and how they configure the plaza for different activities. For 40 years, Gehl has used the public space, public life survey to study what people do in public (how they move, where they stay) and how the physical environment influences their behavior. and frequency of use. It examines whether area residents are engaged in the plaza’s design, programming, management and upkeep. 8. Inclusion and Belonging. Designing for inclusion & belonging looks at how the plaza improves one’s sense of being accepted regardless of difference, and a feeling of safety. 9. Beauty. Designing for beauty measures whether the plaza elevates the physical aesthetics of the neighborhood. 10. Creative innovation. Designing for creative innovation examines whether the plaza deploys unique and creative solutions to address the deficit of active open space in the neighborhood. How is the space protected from traffic, crime or unpleasant sensory experiences? How comfortable is it in terms of being able to hear, talk and see? How much opportunity exists for delight and joy? See Appendix A for full list of metrics. The intercept survey gathered information from users about demographics, perception and use of the plaza, and reactions to the Just City values. 489 surveys were collected at the seven plazas. Surveys were done on a weekday and weekend day, between 8am-8pm, in October 2014. Pedestrian count and stationary activity surveys collected detailed information on where people walk, activities they engage in, and age and gender. Data collectors also assessed the quality and condition of outdoor seating, paving materials, nearby facades, and other qualitative factors that affect the public realm. A number of sources were used to collect data on demographics, residential and worker population, land use and open space, political and community boundaries, police precincts, and community facilities. • collected on a weekday Surveys were and weekend day, between 8am-8pm, in October 2014. 29% of respondents made $0-14,999, 34% made $15,000-$49,999, 20% made $50,000-$59,999 and 16% $100,000 or more. 40% of respondents to the intercept surveys identified as Female and 59% as Male. Less than 1% of respondents identified as Other. 84% of the intercept surveys were collected in English and 16% in Spanish. Survey respondents were predominantly 25-44 years old at 47%, followed by 45-64 years old at 29%. Few surveys were collected from children 0-14 years old and seniors 65+. Survey respondents were predominantly white at 41%, or Hispanic/Latino at 28%. 13% were Asian, 14% were Black/African American. Less than 5% were Two/More Races. Neighborhood Outlines Data was collected at the Census Tract level for Census Tracts with centroids within the half-mile buffer around the plaza also a 10-minute walk around the plaza. greatest exposure to vehicle or subway noise and air pollution, but also the highest rates of activity, as compared to Zion and Meatpacking, which have the highest design quality, but lower rates of use. It appears that the value of these new open spaces is so great that even non-perfect environmental conditions make them important community assets. While the plazas do not necessarily facilitate racial/ethnic diversity and are fairly homogeneous, they do serve as a platform to meet or recognize new people and connect with others, especially at the plazas in residential areas. 80% of respondents at Corona reported meeting or recognizing new people, while less than 20% did at Meatpacking. There are some major similarities between the plazas - walking activity at Corona in Queens rivals that at Manhattan’s Flatiron. Yet while the number of people using these two plazas is similar, their maintenance budgets are not, and Corona Plaza has a fraction of Flatiron’s annual budget. This results in challenges to maintain the cleanliness of the space and setup furniture consistently. One might ask, if these challenges were addressed would the plazas in residential areas be able to invite for even more people and public life? The plazas are equitable in that they increase open space, serve the local community and start off with the same implementation funds and design palette. But challenges arise from operations funding coming from the local community. Choice measured by the public life of the plaza found that plazas are ‘stickier’ – more people stay relative to the number that walk by – on the weekends, indicating that people choose to visit when they have free time. Thousands of people walk through them daily too. Access measured by accessible design and to new land uses or neighborhood services was high for all plazas. Plaza edges are free from barriers, provide high visibility for pedestrians and create direct connections to adjacent land uses, such as retail or transport. Plazas create a place for locals to participate in their community, on a regular basis. Inclusion and Belonging measured by demographic inclusion in the plaza relative to neighborhood demographics found plazas to support income diversity. Beauty measured by the aesthetics of design features found very high levels of satisfaction - across demographics - with the overall appearance of the area. The plazas support high transportation connectivity, but uneven social connectivity, which is higher in the outer borough plazas than in the Manhattan plazas. NYC’s residential patterns are segregated by race/ ethnicity and the plazas reflect this. While racial/ ethnic homogeneity at the plazas where visitors are local matches citywide patterns, it is less clear why there is a match at the Manhattan plazas, which attract people from the entire City or from outside of NY. People want to take care of their plazas. While intercept surveys don’t necessarily reflect what people would do, they indicate that people feel a sense of stewardship and ownership for the plazas, across the board. The plaza program is an innovative new public space appropriation program led by city government, that engages local partners in developing open space in their neighborhoods. Plazas increase the amount of time people spend outside, but to understand more direct impacts on health a longitudinal study is necessary. Clinton Hill / Bedford Stuyvesant, between Cambridge Pl, Grand Ave and Fulton St.
New Lots Avenue Triangle Merchants Association, Inc. Outer borough plazas are surrounded by residential land use. But all plazas are adjacent to retail, except for Zion, which is adjacent to a school and park. Zion Triangle is adjacent to a school and senior housing. Corona Plaza is in a residential area, but is still adjacent to retail. B Plaza Home orFacilities Senior Center New Lots Plaza Nursing Community Zion Plaza Community Facilities Corona Plaza Community Facilities ! B In Manhattan’s CBD, many trains and buses B are adjacent to Flatiron Plaza. New Lots Triangle is at the entrance to the 2 train. Most plazas are adjacent to public facilities, even in residential areas. When people move in the plazas Afternoons are busy! Walking rates are the highest in the afternoons, between 12 -6pm. Are people using the plazas to eat lunch or relax after work or school? What people do in the plazas Lots of standing and sitting. Some commercial activity and waiting for transit. Very little play and activity. Plaza in Queens has a similar volume of visitors to Flatiron in Manhattan, but has a fraction of the operations budget. Central Business District) that seem to attract higher numbers of young people and people with incomes below $24,999. The Manhattan plazas also attracted a higher rate of people with incomes less than $50,000. Seniors and children at the plazas were under-represented when compared to neighborhood Census data. Equity measured by the distribution of open space found that the addition of the plaza increased the amount of open space in the neighborhood, but only by less than 0.30 percent in most all cases. However, no neighborhood has an open space/people density above the recommended standard of 2.5 acres/1,000 people, and so while the plazas do create more open space, all neighborhoods could benefit from even more. Yet, quantity of open space is only one way to evaluate. The quality of the space can be more of an indicator of use than size. While open space requirements are important, more attention needs to be paid to the quality of neighborhood open spaces. for the implementation and on-going maintenance costs of the public realm to be born by the public sector, shared by the public and private sector or absorbed independently by each neighborhood. All plaza implementation is 100% funded by the City of New York, however, the Manhattan plazas, given their access to corporate sponsors, were able to contribute additional funds to the initial implementation costs. All plazas bear 100% of their own maintenance costs, even though the plazas are still under public ownership. pedestrian volume at Corona surpassed Flatiron by almost 1,000 people. Corona however has only 17% of the Flatiron budget. Choice measured by the public life of the plaza found that plazas are ‘stickier’ – more people stay relative to the number that walk by – on the weekends. This indicates that people choose to spend time at the plazas when they have free time. Higher walking rates in the plazas during the afternoons, between lunch and commuting hours, indicate they also play a role in the ‘necessary’ activities of people’s lives: having lunch during the workday, picking kids up from school, or commuting. Choice measured by public space design found that plazas with furniture, such as seats set-up consistently, and those near busy bus stops, such as New Lots, had more people staying. Choice measured by design flexibility and public space was found to be very high for all plazas. All plazas are designed with a higher percentage of movable furnishings rather than fixed elements, making the spaces adaptable for multiple passive and active activities. Even the smallest plaza, 3,000 sq. ft. , can accommodate a yoga class of 166250 people measured at 1 person per 12-18 sq. ft.
activities, provides visitors with a high range of choices. It is possible that programming leads certain groups to feel more invited than others, such as women or men, but more research is needed. The warmer months see a much higher rate of programming options than the winter time. At others there are lots of opportunities to stay (Corona Plaza). Access measured by pedestrian accessibility and public life/public space was assessed relative to how freely pedestrians could access the plaza, free from vehicular conflicts. Most people surveyed walk to the plazas. Investigation into pedestrian and bicyclist injuries two years prior and two years after plaza installation indicate either no change or slight reduction in pedestrian and bicyclist injuries. We were unable to obtain data about how overall vehicular traffic volumes have changed. How did you get to the plaza? within a 10 minute walk of the plaza. The plazas are also accessible 24 hours a day, 7 days a week. Most plazas had active edges - that engaged passersby - or were adjacent to parks or open space. Even plazas with low activity rates - such as Putnam - foster social connections. People with lower incomes met or recognized new people at a higher rate. Across plazas, people-of-color were more likely to recognize/know more people in the neighborhood, due to the plaza. Note: the plazas that had majority white visitors —Meatpacking & Flatiron— aren’t “neighborhood” plazas; they attracted more visitors than locals, which could influence less connectivity. Connectivity measured by interpersonal connections varied across the plazas. The neighborhood plazas saw more interpersonal connectivity than the Manhattan destination plazas, measured by the number of people that either made new acquaintances or began to recognize the same people in the plaza. Of the plazas with high interpersonal connectivity, there was little difference found between the personal connections made by age and gender, but slight differences by race/ethnicity and income. Connectivity measured by transportation connection was high for all the plazas with all having access to subway and/or bus lines within a 5-minute walk. The large majority of users primarily reached the plazas by walking. The plazas make walking to transit or local shops more direct, and they foster meeting or recognizing other people, which could increase opportunities to build social capital. This is important since both long commute times and lack of social capital (defined as ability to connect and develop social connections with others in the community (by social scientists such as Robert Putnam) have recently been tied to less upward mobility (‘Where is the land of opportunity?’, Raj Chetty et al., 2014). Since the plaza opened, do you recognize or know more people in the neighborhood? The plazas support high transportation connectivity across the board, but uneven social connectivity, which is higher in the outer borough plazas than in the Manhattan plazas. Almost a 1:1 match in the race/ethnicity Plazas of plaza visitors compared to nearby residents. shops – may influence who feels invited to spend time in the plazas. For example, Neighborhoods 30% Corona and Diversity are surrounded 31% by businesses catering to certain cultures 9% (Hispanic/Latino 9% and Southeast Asian, 5% 20% respectively) and Meatpacking and 38% Neighborhoods 19% 26% 15% 17% Flatiron are surrounded by landmarks – such as the Flatiron Building or 9% Meatpacking district – and high-end Diversity Meatpacking Flatiron Meatpacking retail, such as Eataly or Theory – that 15% Plaza Plaza may be more attractive to tourists and wealthier visitors. Both destination and neighborhood plazas were diverse by Flatiron 24% 19% 29% 50% 57% 25% 38% income. Seniors and children were underrepresented in all plazas. Manhattan destination plazas were more diverse by gender. Corona had more women in the plaza than in the neighborhood. Diversity and Putnam had a higher rate of men than live in their respective neighborhoods. The others were fairly balanced. Diversity measured by design diversity found that the design elements of the plazas provided a variety of places to sit, gather, or stand. Ownership measured by informal ownership was high - most people said “this is my plaza.” More informal ownership was felt at the neighborhood plazas than the destination plazas, and visitors were least likely to believe the plaza belonged to them, suggesting that the plazas share a strong identity to their local neighborhood and residents. Ownership measured by neighborhood residential home ownership was found to be on average with borough and New York City home ownership rates. most cases, local business owners led these organizations, with some resident participation. People want to take care of their plazas. While intercept surveys did not necessarily reflect what people would do, they did indicate that people feel a sense of stewardship for the spaces. For example, when asked how they would respond to a large piece of trash in the plaza, the majority said they would pick it up, across the board. What would you do if you saw a large piece of trash in your plaza? Ownership is high even though just 3% of people surveyed told us they participated in the plaza planning process. Additionally, higher income respondents indicated “No, just visiting or traveling through” at a higher rate. Is this plaza Your plaza? Across all incomes, visitors responded “Absolutely Yes”. However, lower-income respondents answered at a higher percentage to Absolutely Yes than higher income respondents, indicating those with lower-incomes have a slightly higher sense of ownership than those with higher incomes. The more local they are, the more often they visit - neighborhood plazas have higher rates of frequent visitors. By age, younger users preferred weekends to weekdays and older users weekdays to weekends. By race/ethnicity and income, a difference was not observed. For time spent in the plazas weekday afternoons and weekends were the most popular, followed by weekday mornings and weekday afternoons. Participation measured by how design enables activity was high for most plazas. All plazas allowed for several kinds of activities, both active and passive, because of the flexible layouts of the spaces and various options for creating different seating and gathering configurations. The plazas had no signage restricting activity. High rates of activity arenâ&#x20AC;&#x2122;t the only measure of success. Some plazas with lower activity rates - such as Putnam - have higher rates of frequent visitors, indicating their value as a community asset and place to spend time outside, regularly. By income, those with lower incomes tended to use the plaza more frequently (daily, weekly) than those with higher incomes. By gender, female users indicated they used the plaza slightly less frequently than the male users. By age, a difference was not observed. By race/ethnicity, a determination was not made. Participation measured by neighborhood participation in management was high in the neighborhood plazas. However, residents of the neighborhood did not volunteer at or staff the destination plazas. All plazas had high participation by area business owners and/or operators. Participation is measured by user activity, both the amount of time spent and frequency of time spent in the plaza. Manhattan destination plazas tended to be used weekly, monthly or rarely. The majority of locals at the outer borough plazas visit daily or weekly. In Manhattan, the plazas are well used, but are visited primarily by people from the greater New York area (Flatiron) or outside of the City (Meatpacking). High rates of participation in the plazas did not correspond to the highest rates of design quality. Using the Gehl quality criteria all the plazas have quality design, but a few are still exposed to traffic and noise â&#x20AC;&#x201C; such as Flatiron and Corona. Despite this, those two plazas have the highest rates of people walking by and using them. The more local they are, the more often they visit. Inclusion and Belonging measured demographic inclusion in the plaza relative to the neighborhood demographics. The neighborhood plazas tend to be more racially inclusive than the Manhattan destination plazas and the Manhattan destination plazas were more income inclusive than the neighborhood plazas. When differences were looked at by time of day, there was no difference observed by income, gender, or race. By age, younger users preferred the weekends to the weekdays; older users preferred weekday afternoons. Inclusion and Belonging measured by design elements that promote safety found little to no evidence of fences, gates or other physical barriers that prevented users from freely moving in and around the plazas. The plazas also had reasonably good lighting levels, although several plaza users wanted to see more pedestrian or storefront lighting. Only one plaza had a surveillance camera and most plazas reported adequate levels of police or security presence. The plazas improved the perception of safety equally among men and women, and among all races. Overall, the plazas are well lit at night and improve perceptions of safety in the neighborhoods where they are located. Beauty measured by the aesthetics of design features found very high levels of satisfaction, with most respondents saying the area’s overall appearance had improved since the plaza’s construction. The levels of satisfaction were similarly high across different demographic categories of age, income, gender and race/ethnicity. Beauty measured by appearance of the plaza was not as overwhelmingly positive, as some plazas had low marks for cleanliness. Some plazas also saw more improvements to adjacent storefront appearance than others, but overall appearance of the public realm improved. Does the plaza improve the appearance of the area? The DOT is taking innovative steps to reclaim street space for people. Yet the program is a work in progress, and there are funding challenges. The plaza program creates opportunities for the city to act as a facilitator and invite community organizations to co-create new public spaces in their neighborhoods. The fact that people report high levels of ownership and positive reaction to the plazas supports the need for more funding. The plazas are quick, interim interventions - additional funding could help to make sure they live on beyond the life cycle of interim materials and can host the programming that invites for all living in a neighborhood. The program allows street space to be re-purposed and reclaimed in a way that seemed impossible just ten years ago. Pearl Street Triangle Plaza, DUMBO What would you like to see in this plaza? health conditions however varied between the Manhattan plazas and outer borough plazas. Outer borough plazas suffered from lower health indexes with higher rates of diabetes, obesity, heart disease. Asthma rates were also higher in New Lots and Zion than in other plaza areas. Health and Wellness measured by Zion levels (active versus passive) activity was found to be low to moderate, with New Lots* people predominately sitting, standing, or passing through. Outside of the occasional programmed event promoting Artsand fitness, all plazas General Audience Currently there is no data available physical health Education Seniors to track the relationship between the were passive spaces. Health + Wellness Cultural Heriage plazas and resident health. This data Other Youth + Family would have to be longitudinally tracked Health and Wellness measured by health (over multiple years) to be able to make demographics of plaza users was found a connection to the plazas and human to be generally high. Neighborhood health. New Lots Specific findings for the New Lots Triangle Plaza are not included as the project team was unable to interview the plaza manager and many changes have taken place at the plaza since the study was conducted. The plaza was part of many real estate changes and city initiatives to reinvigorate Broadway and attracted new businesses. and loved, they are functioning as new neighborhood open spaces that serve local residents and visitors, and they are providing a platform to engage with one’s community and spend more time outside. As the current de Blasio administration works to fulfill OneNYC’s goals and make the city a more equitable place to live, plazas – implemented and planned should be prioritized. As this report has shown, the public realm can be a great equalizer in cities and can be one of the few civic assets where public life can flourish and urban justice can thrive. The following pages outline recommendations for the: local plaza management organizations and the Mayor’s Office; the Departments of Transportation (DOT), City Planning (DCP), Housing, Preservation and Development (HPD), Health and Mental Hygiene (DOHMH), Community Affairs Unit (CAU), and Cultural Affairs (DCLA). 1. Incorporate people and behavior metrics into citywide planning initiatives (including Urban Justice Framework & Indicators) Mayor’s Office; HPD; DCP; DOT; DOHMH OneNYC is a symbol of the administration’s focus on creating a more equitable, inclusive New York. We believe you measure what you care about, and that to ensure people from all walks of life are prioritized across agencies, metrics that focus on urban justice, public life, and public space should be integrated into the city’s existing evaluation methods. The 11 urban justice values, 30 indicators and 74 metrics used in this study can be applied to evaluating the impact of projects large and small - from privately funded public realm improvements to citywide initiatives, such as Vision Zero and the Mayor’s affordable housing plan. In terms of the plazas, city agencies should work with local plaza managers to collect data that helps measure local success criteria and evaluate plazas. The current plaza funding model does not perform the same across all communities. For plazas to reap the same benefits, certain local partners need long-term public support, especially those managing plazas located in under-resourced communities. The $5.6 million allocated to plazas in OneNYC is a great start to address differences in how the public-private partnership works in different neighborhoods, but to support all plazas in low income communities, more financial support is needed. An opportunity to apply for more maintenance funding could be created that is similar to the plaza application process. Plazas increase open space in neighborhoods and create opportunities for people to meet and recognize new people. Plaza implementation can be aligned with OneNYC and citywide affordable housing goals, which may increase neighborhood density. Those surveyed said the plazas improve perceptions and feeling of safety in the plaza area. Survey responses revealed that the plazas led people to spend more time outside than they would have before the plaza’s creation. In some cases, the plazas were also used to support healthy activities, such as yoga and aerobics classes, or adjacent farmers markets. Plazas create opportunities for people to recognize or meet new people, and to spend more time outside in their communities. This presents an opportunity to align plaza implementation with vision zero initiatives to calm traffic and improve safety. Conduct a study to identify how plazas actually might improve safety and help to reduce crash rates on adjacent and nearby streets. In turn, this could help identify locations that can advance support for Vision Zero goals. To further support these healthy activities and behaviors, leverage plaza creation and programming with DOHMH’s building healthy community initiatives to reduce activity related illness rates, such as diabetes. Work with local community groups and residents to identify health related programming they are interested in and how the most healthvulnerable communities can be invited to spend time in the plazas. Additional support could be provided in the form of a targeted needs assessment, which could help plaza managers be atuned to the evolving needs of the community and be more capable to respond to it, such as with events that further allow them to diversify programming and invite for a broader range of resident participation in the plazas. Next Steps: Integrating Urban Justice and Public Life into Decision-Making Processes A tool that uses metrics tested by JMBC and Gehl could be used to better assess impact on urban justice and how to optimize municipal investment Movements seeking to achieve greater equity, sustainability, resiliency and livability are on the rise. Government agencies, design practitioners and philanthropists in particular are working to develop programs that address these aims, but also evaluate the impact of interventions. Our goal in creating a new framework of indicators and metrics was to push the envelop on the evaluation of design’s impact on urban justice and robust public life. We believe the values inherent in justice and public life are not always adequately acknowledged or examined by the existing sustainability and resiliency measurement frameworks. Often these frameworks focus on “the numbers” and not the first hand experiences of the user or beneficiaries of the designed space. The pilot indicator framework developed by the Gehl / JMBC partnership blends these two approaches to provide a more accurate story about how social and spatial dynamics inform urban justice and public life values. the city or community to best align its context to the urban justice conditions most critical to address. Despite this, governments and communities can benefit from having access to this indicator framework as a way to both be “diagnostic” - to benchmark and understand current conditions and performance of public space - as well as “projective” - to provide information that informs goals for future intervention. We are also hopeful that the tool and findings from this kind of evaluation process can aid governments, designers and community change agents in developing design interventions and processes that embed the aspirations of greater urban justice into the outcomes of public space design. Why do people use or walk through the plaza? What’s their perception of the plaza and it’s impact on the neighborhood? Who uses the plaza, and when? The data collected by the surveys was a jumping off point for understanding the social justice implications and parameters of New York City’s plazas. Challenges included not being able to conduct surveys with people who did not speak English or Spanish, unless the surveyor was conversant in another language. Controls for surveyor bias were not implemented so randomization was limited to users who were willing to speak to the surveyors. Surveying of users under the age of 18 was also limited since it required a supervising adult to be present. Over the course of a weekday and weekend, intercept surveys were done at all seven plazas, simultaneous to the observational surveys. The survey questions, both multiple choice and free response, reflected one or an intersection of the Just City and public space, public life values. Surveys were printed in English and Spanish. Surveyors tried to collect as many surveys as possible, either by filling out the form with someone or having them complete it independently. 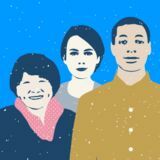 delved into inclusion/ belonging and public life while questions like “Since the plaza opened, do you recognize or know more people in the neighborhood?” related to social connectivity, as well as public life. Intercept surveys were conducted in English and Spanish, and a few in Hindi, at the seven plazas. 489 surveys were collected. The Public Space Public Life Survey is a unique observational field survey technique Gehl Architects developed to identify how to create or enliven public spaces. The survey quantifies how people use and interact with places in cities. It creates an opportunity for city leaders to include people oriented data in the planning and design process to make their needs visible and to consider how existing human behavior can inform strategies to make a place more livable, walkable and inviting to all. Observational surveys were done over two days, between 8am 8pm, in October 2014, on the same days as the intercept surveys. Surveyors worked in four hour shifts to collect data on movement and activity in and around the plazas. The surveyors help to provide a snapshot of public life over two typical days. How do people use their streets? What activities do people engage in? What barriers might inhibit walking or socializing in public? How does what people share in intercept surveys and their observed behavior compare to local Census and demographic information? A plaza neighborhood was defined as the area within a half mile of the plaza (about a 10-minute walk) and what plaza managers expressed as the typical catchment area. Data was collected at the census tract level and neighborhood data was collected for census tracts within the halfmile radius around the plaza. Where it was not possible to collect data at the census tract level, data was collected at the community district or zip code level. When sufficient information was not available new data was created using open source resources. This was the case when obtaining a more accurate analysis of open space in the neighborhood, such as to include public property owned by the NYC Department of Parks and Recreation, NYC Housing Authority, privatelyowned publicly-accessible parks and open space, waterfront parks, and community gardens. A sample of sources: •	U.S. Census Bureau, American Community Survey 2009-2013, Five-year estimates; •	U.S. Census Bureau, American Community Survey 2006-2010; •	Five-year estimates, Special Tabulation for Census Transportation Planning; •	NYC Department of City Planning 2014 Pluto Data; •	NYU Furman Center, 2014 State of the City’s Housing & Neighborhoods; •	New York City Department of Health and Mental Hygiene, 2006 Community Health Report; and •	NYC Department of Parks and Recreation 2015 Directory of Parks Properties as well as others. and worker population, land use and open space, political and community boundaries, police precincts, and community facilities. Desktop research was done to place the survey data into a plazaneighborhood, borough, and citywide context. How was the plaza started? What are the goals of the space? Who is involved with programming and maintaining the plaza? •	A series of interviews were conducted with plaza stakeholders and managers to understand the plaza sites at the outset of the project and to obtain reactions to initial findings and gather additional information. Questions covered programming, operational budgets, funding sources, management structure, maintenance costs, staff makeup, civic participation, the surrounding neighborhood and businesses, security and safety, and rules and regulations. For the full set of questions, please refer to the associated section in the Appendices. The interviews also brought insight into why and how these seven neighborhoods organized to reclaim street space, the challenges they faced in the process, and how the plazas and their associated management, have impacted other community issues, such as health, access, and ownership. Challenges Project staff were unable to coordinate meetings with Agha M. Saleh, Executive Director, SUKHI New York (Management Group for Diversity) and Eddie Di Benedetto, New Lots Avenue Triangle Merchants Association President (Management). •	Interviews were conducted during the plaza study site selection phase, in September 2014, and in the spring of 2015 to share preliminary findings and gather additional information. The Neighborhood Plaza Partnership was an instrumental resource in setting up preliminary meetings with plaza managers.